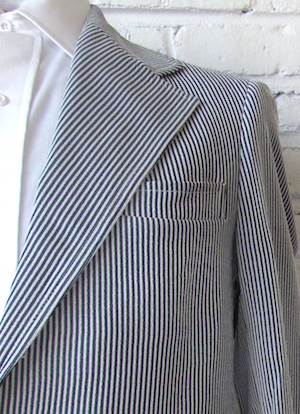 Home > Vintage Suits & Blazers > Suits / Blazers 1970's > (37) Striped and Textured Dark Blue and White Mens 1970s Disco Blazer! 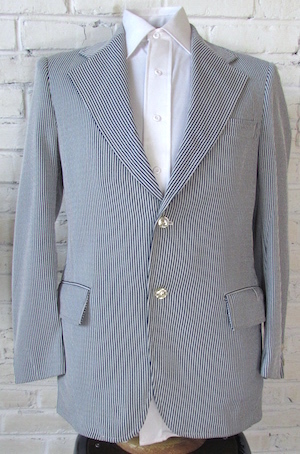 Vintage 1970s striped sports coat blazer. This fantastic double knit polyester blazer features a almost hypnotic raised vertical stripe design of dark blue and white stripes. Two pearly transparent buttons down the front and matching buttons on each cuff. Three front pockets and a center back vent to let your booty pop!. 3/4 lined with wine colored acetate.